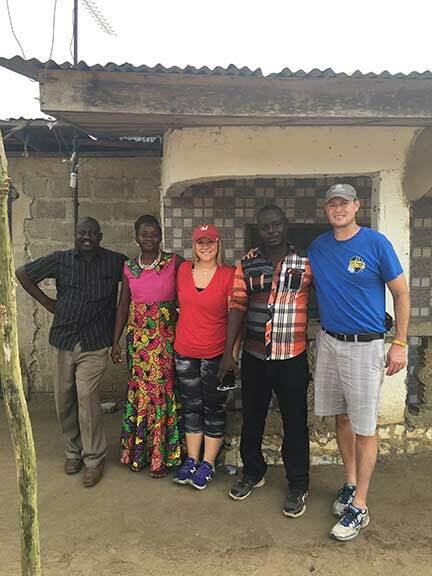 In January 2017, the founder of Strides for Africa, Chris Jimieson, traveled to Africa to visit completed water projects, strengthen relationships with implementation partners, and evaluate future clean water projects. The trip reaffirmed his belief that the need for clean water is strong in rural Africa. He observed progress, yet much work remains to be done. A breakdown of the experiences in each of the 3 countries visited is described by Chris below. 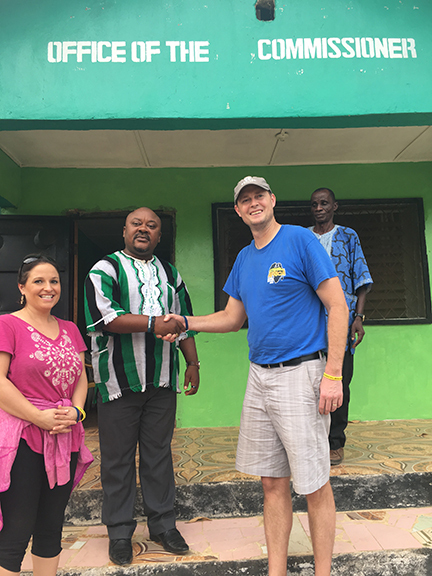 In May 2016, I set up a coffee shop meeting with Dr. Alhaji Njai, founder of a non-profit organization based in Madison called Project 1808, Inc. Project 1808 is a multi-faceted organization in Dr. Alhaji’s home region around Kabala, Sierra Leone. They are focused on empowering youth and have dreams to build a university in Kabala in the coming years. Dr. Alhaji mentioned the new “environmental arm” to their organization that had aspirations to help out people in the region with clean water projects. I mentioned our aspirations to conduct water well work in Sierra Leone and a partnership was born. From the Strides for Africa 2016 run/walk event, funds were raised to build our first water well in Sierra Leone and on November 10, 2016, Chris presented the funds to construct both ours and Project 1808’s first well in Sierra Leone. Project 1808 has strong ties and connections within the region, so in our eyes, they are a perfect implementation partner. They understand the community structure and where the pockets of needs are strongest in Kabala. On January 3rd, I arrived in Freetown, Sierra Leone around 6:00p.m. with my travel team from another one of our partner organizations, Feeding Mouths, Filling Minds. I travelled with the founder of Feeding Mouths, Filling Minds, Maria Nicholas Groves and one of her key team members, Amy Hegg. After a meal, we began our 5 hour journey to Kabala to view our progress on our first well and attend Project 1808’s 2nd Science and Leadership Festival. The next day we visited the Strides for Africa funded well, which had been partially dug. This experience amplified the need in this part of Kabala in a community called Bilimaia. We met with the chief of the chiefdom where this water well is being placed. 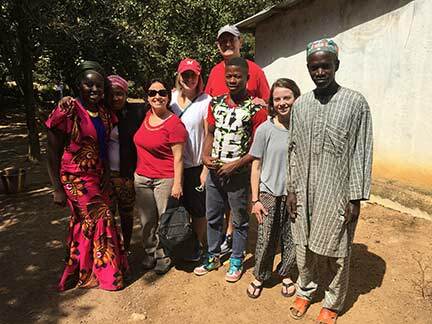 Through a translator, the chief passionately explained the importance of clean water for his chiefdom of approximately 2,000 people. Their current well lacks wellhead protection, so the water is susceptible to more waterborne diseases. He mentioned that people of his chiefdom were lining up to get water starting at midnight for water that could be retrieved at 4:00am. Within this group each night was a student from Project 1808, who read books while he waited for water for his family each night. He was with us when we visited the location of the new well. We also met with the local Ministry of Water Resources, and learned of the importance of getting the buy-in on these clean water projects by local government. Plans are to keep them informed through the project and get their help on collecting water samples to ensure water quality when the well is ready to be commissioned. The chief was very appreciative of our support of this water project and provided oranges and a yam as appreciation gifts. See chief of Bilimaia on far right of photo below. The remaining time in Kabala was spent at the Science and Leadership Festival, which was a remarkable local, national, and global collaboration giving children the opportunity to come together and experience science. We were present to see kids looking through a telescope for the first time, or seeing a high school student gaining knowledge on how to conduct interviews or prepare a resume. We saw remarkable skits and songs performed by both student and national groups. I had amazing hospitality during my stay in Sierra Leone. Project 1808’s aspiration to build a university is very inspiring. We are very proud to be their partner to help out the people in this region. Within 10 minutes of leaving the airport in Liberia, I laid my eyes on Strides for Africa’s first well in Liberia (see caption photo) that was completed in 2015 shortly after the ebola crisis. 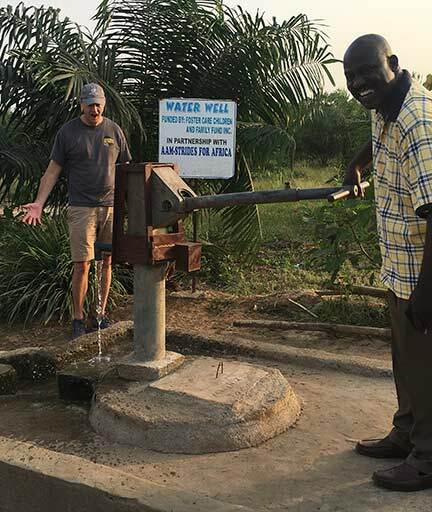 Seeing a functioning well with water coming from it was truly an exhilarating moment of the trip, especially when you consider the ebola crisis that was going on while the well was being constructed. At the time of the visit, we had scheduled visits to four of Strides for Africa’s eight completed wells in Liberia – all since the beginning of 2015. We also made arrangements to visit two schools, one of the schools – Fountain of Life was in the process of having funds raised for it by schools in the United States, so that the school could have a clean water source on-site. The students at schools in the United States provided questions for the students in Liberia. While there, we shared these questions with the students. I learned that questions from U.S. students to Liberian students needed some explanation. The Liberian students hadn’t seen or known any different than the way they had gone about collecting water. The water distribution process in the United States, where typically each home has a clean water source was challenging for them to comprehend. 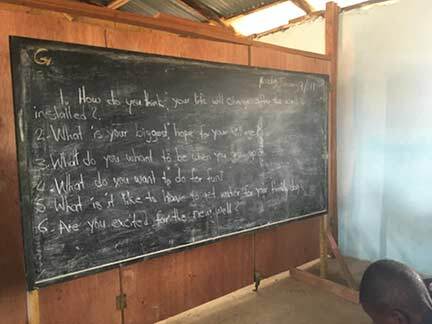 Photo showing Questions from U.S. Students to Liberian students at Fountain of Life school. 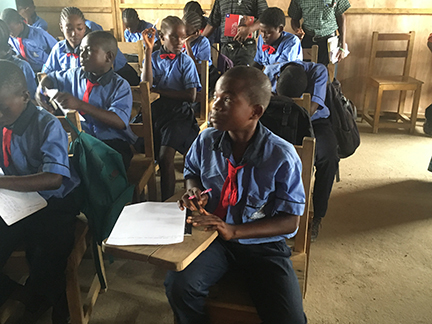 Students as they responded to students from the United States during an interactive session at Fountain of Life School in Liberia. Responses were shared with U.S. students upon returning in January 2017. Strides for Africa founder, Chris Jimieson, and Feeding Mouths Filling Minds founder, Maria Groves, meeting with the Commissioner of Johnsonville where Strides for Africa is actively placing sustainable water wells. We made some remarkable connections in just 3 short days in Liberia. We are fortunate to have such great implementation partners on the ground in Liberia in Humanity Care Liberia and Live Life Liberia. The prospect for continued work is strong, and we will forge ahead carefully to ensure our new water sources have proper security. Upon arriving in Rwanda, the rolling hills and beauty of East Africa brought back many wonderful memories from the adoption of my child, Myles, in 2009, from Ethiopia. We quickly made our way to the site of our clean water project at the Imizi’s Children Center, approximately 1 hour outside the capital city of Kigali. The Imizi Children's Center is run by a U.S. based non-profit called the Rwandan Orphans Project. Our host was the Executive Director of the Rwandan Orphans Project named Sean Jones. Seven years ago, Sean was working at an IT job in the United States, but he wanted to find a small non-profit that could fulfill in life in a different way. Sean took a giant leap and after 7 years of putting his heart and soul into this project, he runs a successful center for street orphans. Rwandan Orphans Project is a transition center for street children, a free primary school for local children from poor families, a program that supports vocational training for young men and a community center that provides social support to struggling families. They own a center on the property but were struggling with the cost and inconsistency of the water distribution system at the facility. It cost them a lot of money, and their water service was very intermittent. Strides for Africa co-funded a project with Feeding Mouths Filling Minds to capture water from the roofs at this facility and store via a water collection system in a large on-site cistern. The water will then be filtered prior to use at the facility. Water Cistern at the Imizi’s Children Center in Rwanda Traditionally, we place water wells in areas of need. 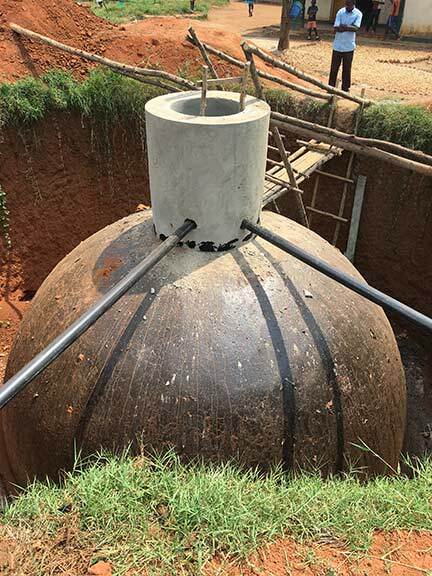 However, with a water table of approximately 300 feet in depth, this water cistern project was the most cost-effective means to provide a sustainable, clean water source to this transition center. Sean is diligent about constructing projects the right way. This project will serve this facility and its kids very well for years to come.